TITE-LOC TITE-LOC HS PANEL PLUS TITE-LOC SMOOTH PANEL SMOOTH PANEL WITH STRIATIONS SMOOTH PANEL (OPTIONAL) 2" WITH STRIATIONS SMOOTH PANEL (OPTIONAL) WITH STRIATIONS (OPTIONAL) WITH STRIATIONS SMOOTH PANEL STRIATIONS W/ PENCIL RIBS (OPTIONAL) 2" 2" IONAL) GEORGIA FACILITY ONLY WITH STRIATIONS W/ PENCIL RIBS STRIATIONS (OPTIONAL) GEORGIA FACILITY (OPTIONAL) 2" ONLY 2" WITH STRIATIONS W/ PENCIL RIBS STRIATIONS PENCIL RIBS GEORGIA FACILITY ONLY (OPTIONAL) 2" (OPTIONAL) 2" (OPTIONAL) STRIATIONS W/ PENCIL RIBS (OPTIONAL) STRIATIONS W/ PENCIL RIBS PENCIL RIBS (OPTIONAL) 2" (OPTIONAL - LIMITED AVAILABILITY) 2" PRODUCT FEATURES ÝÝ 20 year non-prorated finish warranty STRIATIONS W/ PENCIL RIBS ÝÝ 37 stocked colors (24 Gauge Steel) PENCIL RIBS (OPTIONAL) 2" 2" ÝÝ Available in 3 variations - see profile drawings to right . (OPTIONAL - LIMITED AVAILABILITY) ÝÝ 13 stocked colors (22 Gauge Steel) Check local factory for panel condition availability. ÝÝ 36 stocked colors (.032 aluminum) ÝÝ Maximum panel length of 64 feet (check local factory for 12", 16" or 18" O.C. 12", 16" or 17-5/8" O.C. 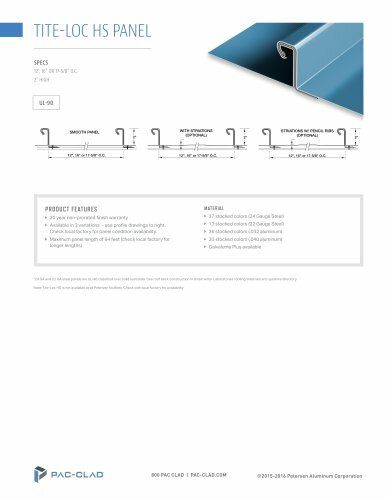 longer lengths) ÝÝ 20 stocked colors (.040 aluminum) ÝÝ Galvalume Plus available *24 GA and 22 GA steel panels are UL-90 classified over solid substrate. See roof deck construction in Underwriter Laboratories roofing materials and systems directory. Note: Tite-Loc HS is not available at all Petersen facilities. Check with local factory for availability.